The Asiatic Lions rule this place. With over 500 of them living in and around Gir National Park, other predators have to be very careful. So, when we encountered this Golden Jackal (Canis aureus) at daybreak one winter morning, it was on high alert and was jogging along purposefully. Our intrusion seems to have made it curious enough to pause for a few seconds, before it took off again. When I reviewed the photograph, I was surprised to see how wide the eyes were open. Was it surprise in the eyes of the Jackal? Or fear? And then the realization came. In the near darkness, the pupils of the Jackal were almost completely dilated to improve its vision. Since there was really low light, the ISO was on the higher side. It should’ve been higher given that the shutter speed is very low (1/50 sec). It was my turn to be surprised at how well the VR (Vibration Reduction) on the lens worked in this situation. 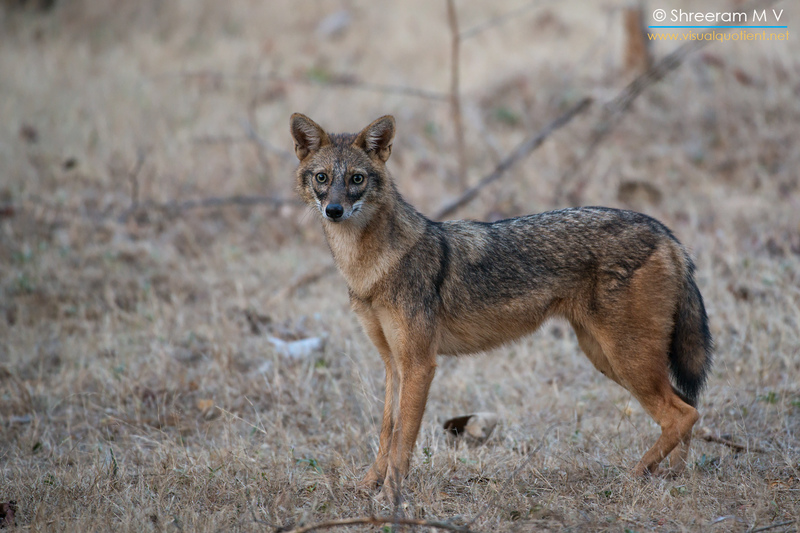 And thanks to the Jackal for standing motionless for that moment when the photograph was clicked. « The World’s Smallest Eagle!